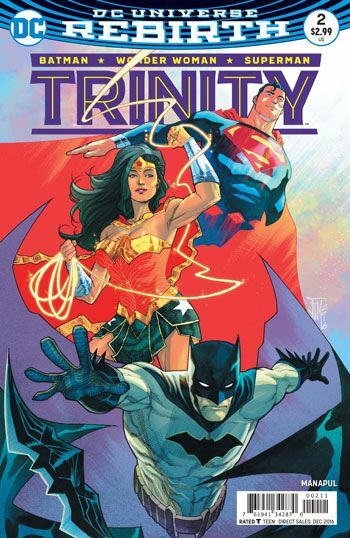 Fathers and sons are the central theme in the second issue of Trinity, by Francis Manapul. Most of the story is devoted to the unusual time flip that Superman, Batman and Wonder Woman are experiencing, encountering a very young Clark Kent and his father, Jonathan. But there is also one brief but effective scene between Lois Lane and her son with Superman. The difficulties in parenting a child with super-powers is raised in both of the plot threads, and how the best of goals and intentions are rife with problems beyond those of raising a normal child. It’s great to see Jonathan Kent’s horror at meeting Superman. He recognizes the crest that Superman wears from the ship that brought the boy to Earth, and is terrified of losing the child he has grown to love. The story also effectively details the different reactions that Superman, Batman and Wonder Woman have to being in what seems to be the Smallville of many years ago. Batman is highly suspicious of everything around him. He is Batman, after all. And by the end of the story it seems he was right not to trust all that he sees. Superman is so busy experiencing a return to the idyllic memories of his early life that he accepts it all unquestioningly, while Wonder Woman is given the role of being the middle man. Or middle woman. Middle person. Dang, only “middle man” has the proper alliterative flow. Anyway, in that role, she somewhat gets slighted in this issue. But after the well written part she had in the first issue, I have no fears that she will become the least of the trio as the book goes on. Manapul’s art is also extremely good at conveying the emotional states of the various characters throughout the story, both in terms of their physical reactions, but also in what he chooses to illustrate, and how. We feel Superman’s nostalgia, Jonathan Kent’s fears and Batman’s distrust. As with the first issue, I am not entirely certain where this story arc is going, but I really don’t mind not knowing the direction when the ride is so much fun.